In this Free CCNP Lab we will use the previous GNS3 configured BGP lab and will expand on it by creating a summary address for the 172.16.0.0 network using the Cisco IOS command aggregate-address. The aggregate-address ip-address mask [summary-only] [as-set] router configuration command is used to create an aggregate or summary, entry in the BGP table to network that already exist within the BGP tables. This is different from the requirements for advertising summaries with the BGP network command where the network must exist in the IP routing tables. In this lab we will be using the summary-only keyword which will advertise only the summary address and the path indicates only the AS that is summarized. Display the existing routing table on R1. Note that there are 5 entries in the routing tables to the 172.16.0.0/16 network. Display the BGP tables on R1. Advertise only the summary address for the 172.16.0.0 network. Display the routing tables on R1. Note that now the 172.16.0.0/16 network has been summarized into a single advertised address. From R1 ping the 172.16.0.1, 172.16.1.1, 172.16.2.1, and 172.16.3.1 address and insure they can be reached. 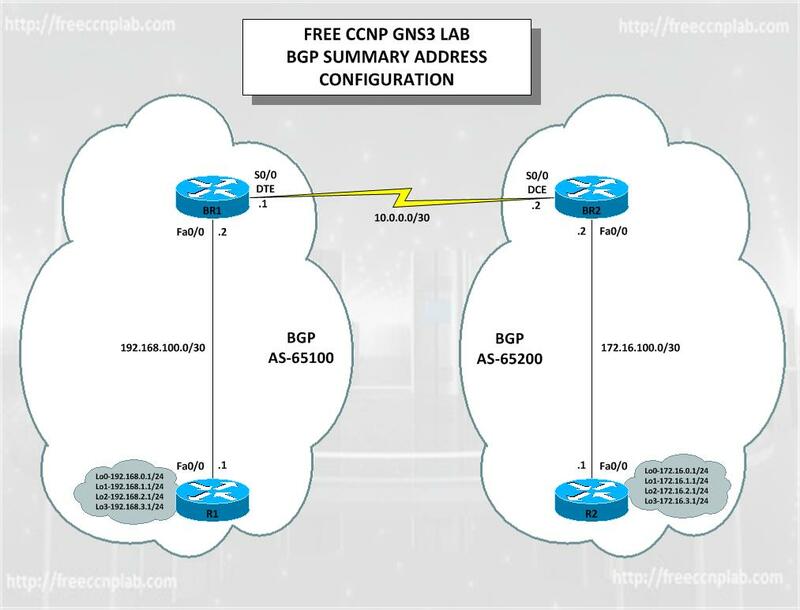 This concludes this free CCNP BGP summary address GNS3 lab.